1. SEO: The Google March 2019 Core Algorithm Update and new measurements in Google Lighthouse. On March 12, Google announced what the SEO community is now calling The Google March 2019 Core Update, which Google is being very elusive in regards to the changes that can be expected in SERPs. The changes from this update are rumored to be a reversal of the Medic update back in August 2018 or related to the Penguin or Panda updates. With this update still being rolled out, the impact on search results is still being measured with more announcements to come. Google Lighthouse adds tap target spacing to audit results. With mobile page speed and optimization taking the forefront in SEO, Google Lighthouse has become a vital tool for measuring mobile impact on search engine rankings. 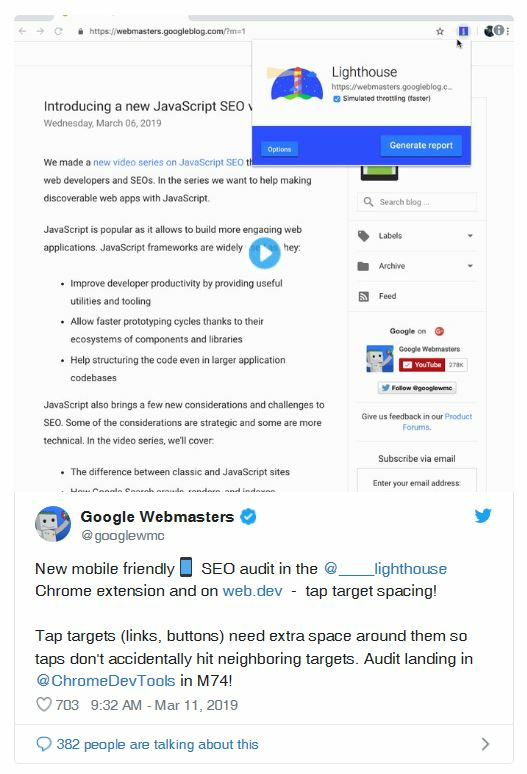 Google has updated Lighthouse to measure tap target spacing on mobile websites which will be incorporated in audit results and factored into the SEO score. As Google explains, tap targets are important for mobile design because placing targets too close together could result in accidental selections. Now, Lighthouse will determine if tap targets are sized appropriately or not. If not, the audit may recommend tap targets as an action item for improving your SEO score. Your hotel should keep mobile optimization top of mind since the mobile-first update continues to take effect and impacts rankings in search engine results. 2. SEM: Google soon to launch Policy manager in Google Ads to give advertisers a clearer picture of whether their accounts are experiencing any policy restrictions. Starting in April, Google will release a new Policy manager dashboard in the Google Ads interface to show any policy-related issues affecting ads, keywords or ad extensions. Users will be able to view and manage disapprovals across accounts with added details on why the ads are disapproved. Google is also adding new features to the Policy manager, including recommendations for fixing violations, and a historical record of appeals and certifications associated with your account. Even better, soon, when creating new ads in the interface, Google will alert users in real-time if it detects a policy violation. Who does this mainly affect? Casinos and resorts need to be careful with messaging as to not appear to promote offline gambling, and vineyard resorts need to be careful with alcohol-related messaging. 3. Display: Video comes to Google responsive display ads. Like responsive search ads (RSAs), Google responsive display ads are largely automated, with advertisers adding multiple images, headlines, descriptions and brand logos that get served in different combinations and ad sizes dynamically. Now, advertisers can add up to five YouTube videos to be dynamically served in different combinations with other elements in ad creative. Furthermore, Google responsive display ads are adding other new features such as a combination report designed to give advertisers more insights into which groupings of assets and copy are performing best and a new ad strength score that shows progress reports on the number and quality of images, headlines and descriptions, and “next steps” tips for improvement. 4. Social: Instagram introduces in-app checkout for e-commerce brands and explores new ways for brands to promote influencer content. Instagram is rolling out an in-app checkout feature for a limited number of brands, making it possible for users to purchase products without leaving the app. The limited launch has been extended to 23 brands including Adidas, Burberry, Dior and more. While the roll-out is currently focused on retail brands, this new checkout feature could potentially be available for hotel bookings in the future. In other Instagram news, the company is exploring more ways for brands to amplify content from influencers, and have been testing a new branded content ad format since last year that allows brands to turn posts created by influencers into ads on the platform. As influencer marketing gains more and more traction in hospitality and travel, these new promotion features will allow hotels to expand reach of influencer content associated with their hotel. 5. Design: Monochromatic color schemes. Taking a hint from fashion trends, monochromatic color schemes are rising in popularity in website and marketing design. While most digital assets have two to five colors that are used throughout, utilizing different shades of one color can help your brand make a statement and stand out from the competition. Go bold and consider monochromatic color schemes for display ads or an email marketing campaign.